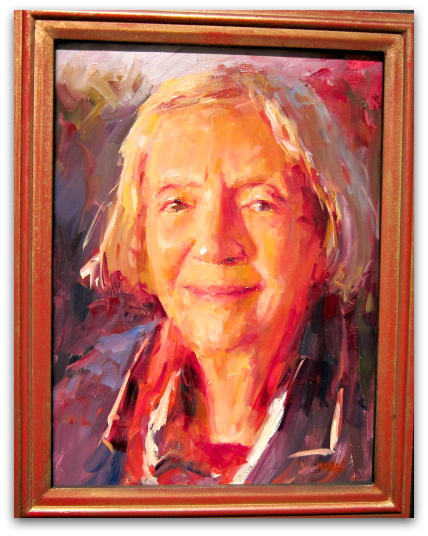 Last Friday, I attended an art opening at the Blue Heron Gallery on Vashon Island: Portraits of Elders – People Who Inspire. 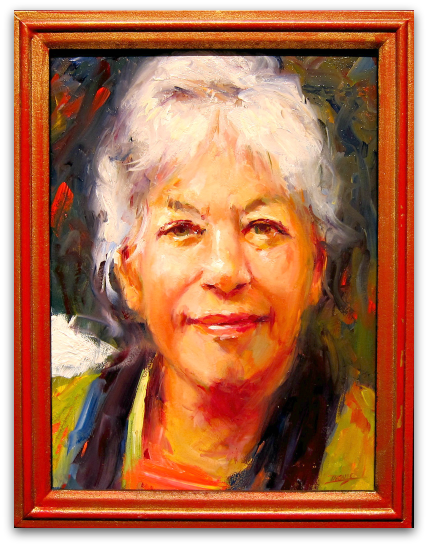 While I’m a big fan of one of the featured artists, Pam Ingalls, I’m equally devoted to three of the women she captured in portraiture. Nina, Phoebe and Karen have rock star status on the island, though they would likely be chagrined if not incredulous at such a claim. As it should be, anyone who knows one or any of these three muses is rightfully inspired by their lives, and by the magic, wit and vibrancy they bring to each moment. How do I know these fine women? Lucky me, I happen to live across the street from Phoebe, and since they are all friends, I’ve managed to insinuate myself into their Friday tea time and on-the-kitchen-table art classes. Truth be told, I yammer, sip and munch, while they share insights, laughter and brush strokes. In my defense, I am a willing mascot and booster for this team and have finally learned restraint when dolloping up Phoebe’s jam and marmalade. The art show left me pondering (good use of one’s hammock). If I may leave you with one thought, may it be this. We spend our lives shuffling about, making lists, running errands, pursuing careers and dreams, and we tend to forget (if I may speak broadly) that the silver-haired souls among us have been there, done that. The elder we may overlook or be oblivious to has a story, no doubt a rich tale of decades of living, loving, learning and celebrating. There’s a life behind those wrinkles. Who knows, maybe you’re in the presence of a fine potter, gifted storyteller or spirited singer. Perhaps this kind soul grew up in Africa next door to Karen Blixen, or raised her firstborn in a small cabin in Norway, or gained passage for her family on a tramp steamer to Italy. Could this gentle soul have bravely served her nation in World War II or danced in the streets of Florence and embraced music at every turn? 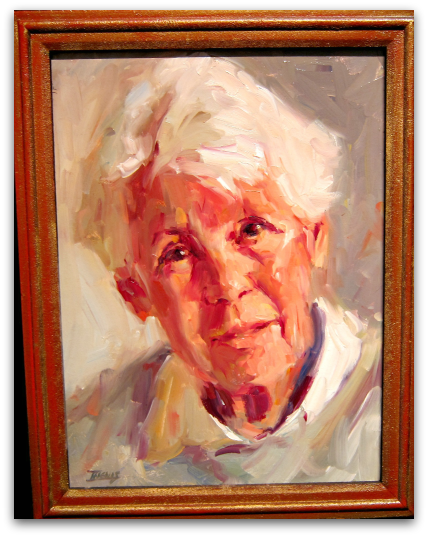 These are neither random nor conjured speculations, but rather truths — the authentic bits and pieces of the full lives of the women found in these portraits and on this page. Sparkling eyes (no matter what the age or medium) never lie. 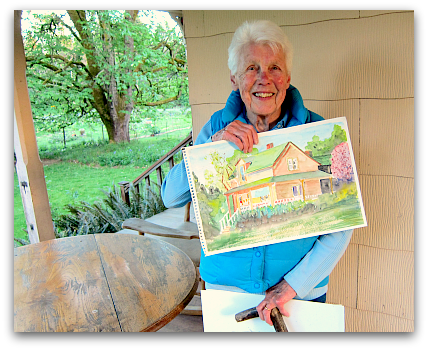 Phoebe the painted; and Phoebe the painter (sharing her watercolor of my house). “Youth is a quality, not a matter of your circumstances.” –Frank Lloyd Wright. PS – Here’s a movie recommendation, Strangers in Good Company, which I saw at the Seattle Film Festival in 1990. A beautiful film that shares the tales of real lives within the framework of a scripted movie. It may change the way you think about your elders. What a lovely piece and so very true! Thanks for sharing! Thanks Lisa, I’m a fortunate man to be embraced by your family, where the whole lot is something special. A thoughtful “hmmmm” and heartfelt “yes” to all your musings here. Off to take me 85 year old mum on a kayak trip today. Sandra, that just says it all, about you and about her. Dang, kayak trip with Mom! So where did you two take your adventure? This is awesome, Tom. What a tribute to these lovely women. I’ll re-visit this post often–it’s a keeper. Thanks for always inspiring us! Thanks Pam, they are pretty wonderful. I want back in! To the group. The painting group. I’m doing watercolor again. Miss you all. Kick him out. It’s not like he can cook or something. Uh-oh. Keep him in. I’ll bring my own chair. Take a vote. Secret of course. Let me know. Whoa, Joy, now hold on a sec, I fear you would win this secret election. I’ll have to do some campaigning and baking before we have the vote, oh yes, and maybe less talking from me during painting studies, would help my cause. Tom, thank you for your wonderful words about those of us who are now in that elder category (even though we mentally aren’t a day over eighteen). I’m seventy and my husband is 67 and we are still working and learning everyday. Loved reading this, Tom. Again… it sounds as tho’ Vashon Island is very special. Nicely said. I recently had the pleasure of 3 twenty-somethings stay overnight with me who were cycling across Canada. Every time I opened my mouth they had a better solution. Sad that it takes so long for us to appreciate the wisdom of age. Lovely portraits. I am surprised you didn’t buy all three. Thanks Tom for sharing! It’s a common joke in our family that once we get over forty, we tell everyone what we really think because we are past the age for worrying about offending anyone. That may be so but I do know I laugh alot more since I passed the fifty year mark several years ago. What an inspiring post. And a great tribute to these beautiful women. I myself know a couple of inspiring elders. Thanks for sharing. Thanks Pam, your art brings out the best in all of us. Your canvases awaken and find the beauty in the viewer, the sitter and the place.